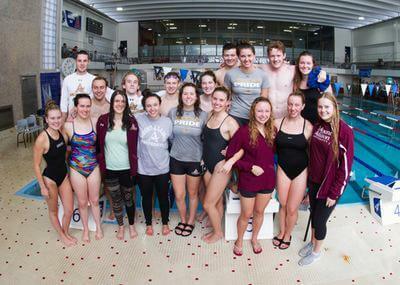 The Mounties participated in their last meet of the 2018-19 swim season at the Subway Atlantic University Sport (AUS) swimming championships this past weekend at Dalhousie University. During the event, the Mounties made the podium in men’s 200-m freestyle, when Noah Mascoll-Gomes, a first-year arts student, placed first with a U Sports qualifying time of 1:50.24. Mascoll-Gomes also finished second in men’s 200-m backstroke. The team picked up a bronze medal as Maddy Henry, a fourth-year commerce student, finished third in women’s 200-m backstroke. Henry has competed on the swim team throughout her four years at Mt. A, and is one of the team’s captains this season. During the AUS championships, Henry competed in the women’s 50-m and 200-m backstroke. She also participated in the team event for 200-m freestyle relay with Jillian Downey, first-year biology student; Megan Fitzgerald, second-year chemistry student; and Sabrina Baker, third-year chemistry student. Siena Davis, a fourth-year biology student, has been on the swim team for her four years at Mt. A. Last weekend, Davis competed in women’s 100-m freestyle and 50-m backstroke. Davis attributed a portion of the team’s success to the mixture of new athletes and graduates who were potentially facing their last opportunity to compete. 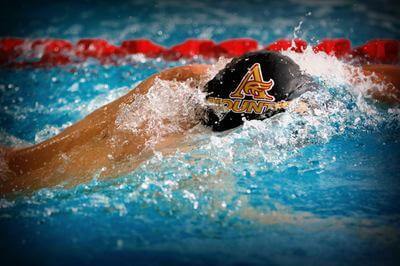 With six graduating and six first-year athletes, the team has a combination of veteran and novice swimmers. Henry praised the members of the varsity swim team for their individual efforts during the AUS championships. “Everyone has set individual goal times for their races and worked very hard to achieve them,” she said.